The Bundeseisenbahnvermögen (BEV), aka the German Federal Railway Authority, is offering an exciting if ominous real estate opportunity: half of the ruins of the Ludendorff Bridge are for sale, price negotiable. 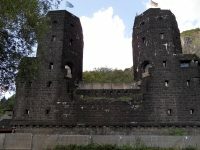 The two looming, blackened, massive masonry towers in the town of Erpel on the east bank of the Rhine and their twins on the west side are all that remains of the railway bridge built during World War I to aid in the movement of troops and supplies to the Western Front. It was barely completed when the war ended and the Allies occupied the strategic site. By the terms of the Treaty of Versailles and the Locarno Treaties, the German military was excluded from the entire territory, and specifically from controlling any access points on both sides of the Rhine. It wasn’t until 1936 with the Remilitarization of the Rhineland under Hitler that the Ludendorff Bridge returned to German control. Germany would enjoy that control for less than a decade. On March 7th, 1945, the U.S. Army’s 9th Armored Division took the bridge. It had been damaged by Allied bombing and German attempts to demolish it before the Allied troops could use it. The underpowered demolition charges had failed to destroy the bridge, giving the Americans the opportunity to move six divisions, 50,000 troops, over it, establish a bridgehead on the east bank and build a pontoon bridge to move the rest of the US forces. On March 17th, the bridge collapsed, killing 28 U.S. Army Engineers who were attempting its repair. Here is period color film of the bridge before and after it collapsed. The focus is on the spans of the steel bridge itself which is, after all, the key part of any bridge, but the towers on both banks are also in high relief. It is in need of major refurbishment and due to the danger of falling facade parts, the duty of care must be observed: pedestrians, cyclists and car traffic runs in the immediate vicinity. No residential object. Notwithstanding its challenges, the bridge has interested buyers, or so says the BEV spokesman. Adding to its dark allure may be the 1969 film The Bridge at Remagen, starring George Segal, Ben Gazzara and Robert Vaughn, which tells a highly dramatized version of the bridge’s role in World War II. It’s not remotely historically accurate, of course, but war movies are adroit mythmakers. It has also been featured in several video games, most recently Call of Duty: Finest Hour. The towers in Remagen on the west bank of the Rhine are not for sale. They currently host a museum dedicated to the bridge’s history in wartime. Anybody who wants an unheated, waterless, crumbling, lawsuit-waiting-to-happen insurance nightmare that is legally enjoined from being used as housing but comes with a darn cool military history has until May 18th to submit a bid.